Undercover Black Man: Whatever happened to Muzz Skillings? Hey UBM. After 'Vivid' what's a good album to pick up? They're one of those bands that I know I'll go crazy over if I sit down and listen to them. ^ Try to find the 15-track import version of "Biscuits." It's live tracks and studio odds-and-ends, but I find myself spinning it often. Hard-rocking covers, including "Love and Happiness." that was kind of weak. i wonder why muzz left? doug wimbish is a HUGE upgrade though muzz was no slouch. Lyndon, Stain is also very, very good. But don't discriminate. get all their albums/cds. Dude, Muzz was a BIG reason why you ever heard of Living Colour in the first place. Muzz was key in creating that special, original rock sound they had up until the time he left. He, along with Vernon, Will and Corey were pioneers and inventors of a genre. Doug walked into a great situation, already built by Muzz and the guys. Muzz swung and grooved harder (than Doug, who is no slouch), and the band still needs that today. They are very good, but I miss that REVOLUTIONARY band sound, cohesive and tight-knit, POWERFUL. I realized it when I saw them with Muzz on bass last August. EPIC. Not to start a battle between me and you or Muzz and Doug. But Doug brought a whole different dimension to Living Colour, and trust me, A.G., I dig Muzz. ^ DeAng: I meant to tell you... Muzz vs. Doug is a raging debate amongst Living Colour fans. Wow, Muzz has a lotta love. I think Doug is more entrenched and just as much a leading voice. Caught these cats on the reunion tour and Doug dominated. The common theme, unspoken, was that Muzz was more of a support player. Doug is co-lead. Check Jungle Funk. Interesting post. Thanks Dave. Doug is son of Bootsy. I've seen both versions many times. In musical terms, the BAND sounds more powerful, and innovative, with Muzz. Muzz' playing is more conversational, laced with interplay. Muzz and Will are still one of the most innovative rock rhythm sections ever to exist. IMHO, Muzz makes Will sound like even more of the drum god that he is. The original four of them together have that special aura, energy, projection that launches them over the top in terms of their effect on the world. There is a reason why they were world-wide then. When Muzz is with them (Harlem Day 2008, wow) something major changes. If he ever plays with them again, I encourage you to check it out. There's really good and then there's great. There's Doug and then there's Muzz. Glad to see Muzz getting some recognition. Always loved his playing. I got to see LC last year with Doug holdin' down the bass in a small club here in Cali. Doug Wimbish is as good a bassist as you will ever find. But Muzz leaving Living Colour changed the band, and not really for the better. Muzz's style just fit in better, in my opinion. When he left the band, the funk element that made them so unique did too. Doug might be a more technically proficient player, but Muzz's style is what made him right for LC. Gotta throw in with Muzz, too. I'm a professional bassist in LA and that guy shaped my playing in so many ways I can't even begin to describe his influence. His playing fused utterly stunning melodicism with funk, swing, complex world rhythms, and blistering riffing in a way I haven't heard since. He was a true innovator in every sense of the word, and when he cut out the energy went with him. Doug a good player and all, but c'mon, guys - That groove isn't even a fraction as deep as it used to be. Muzz vs. Doug...I wish I could play half as well as either, but I gotta say I liked LC a lot more with Muzz than without. 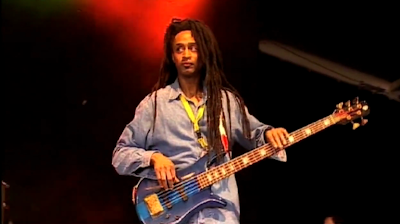 Wimbish is like the Yoda of bassists. He never ceases to blow your mind with his playing, but sometimes he's just too over the top for me. Muzz put down a groove that kept your body moving and held down the low end of the sonic spectrum. From Stain on, LC was more of a head banging band than a solid groove band.